Kidney beans are a very good source of cholesterol-lowering fiber, as are most other beans. In addition to lowering cholesterol, kidney beans' high fiber content prevents blood sugar levels from rising too rapidly after a meal, making these beans an especially good choice for individuals with diabetes, insulin resistance or hypoglycemia. When combined with whole grains such as rice, kidney beans provide virtually fat-free high quality protein. But this is far from all kidney beans have to offer. Kidney beans are an excellent source of the trace mineral, molybdenum, an integral component of the enzyme sulfite oxidase, which is responsible for detoxifying sulfites. Just one cup of cooked kidney beans supplies 177.0% of the daily value for molybdenum. Sulfites are a type of preservative commonly added to prepared foods like delicatessen salads and salad bars. Persons who are sensitive to sulfites in these foods may experience rapid heartbeat, headache or disorientation if sulfites are unwittingly consumed. If you have ever reacted to sulfites, it may be because your molybdenum stores are insufficient to detoxify them. Be sure to share the recipes, warm the hearts of your family and friends. Are you a part of Christine's Pantry on facebook? If not, you're missing some fun. Preheat oven to 350 degrees. In skillet, cook beef over medium heat, stirring occasionally, until beef is no longer pink. Drain excess grease. Stir in kidney beans, diced tomatoes and green chilies, tomato sauce, garlic, onion, chili powder, paprika, crushed red pepper, salt and pepper. Place meat mixture in baking pan or casserole dish. Sprinkle mozzarella cheese over top. Place in oven until cheese melted and bubbly. Enjoy! This is what I'm talking about! I love homemade Mexican food, it's the best! This looks amazing, the cheese is making me I'm drooling :) This is an awesome recipe! It looks yummy Christine, I want to try to make mexican food sometime.. maybe the time is now! 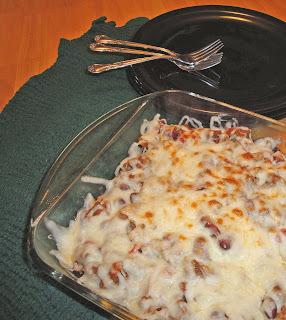 Great Mexican casserole dish, very hearty and homey! This recipe sounds so good. I love anything mexican food related....and especially with mozzarella cheese. Love that this is a casserole too. Yummy esp with the cheese topping. I'm happy to blog and happy to hear from you. Thank you to all of you, for being a part of Christine's Pantry. Looks delicious and easy too. Yum! Oh cheese and kidney beans. I am in heaven. This looks great Christine! This is my kind of casserole! Love Mexican casseroles! Sounds like a fantastic meal, Christine! I would love a helping of that cheesy goodness! Yum! I really need to use more kidney beans! I use them in red beans and rice, but that's about it. I love that you used them in this delicious looking casserole! I bet this would be good spooned over tortilla chips and ate like nachos. This looks good, thanks Christine.